If carriers or vendors have unauthorized or unsupervised access to your riser, it raises the risk of errors that could take your building offline. Riser management improves reliability by limiting access to your building’s communications infrastructure, unless the work is approved or performed by IMG technicians. We protect your riser by keeping it in peak operating condition. Our technicians identify and correct potential problems to ensure service isn’t interrupted. Space in your riser is valuable, so we track all equipment and cabling to ensure that your riser is clear of unnecessary equipment. Building management is required to limit access to the NETPOP/MPOE and riser closets for the duration of an IMG riser management agreement. 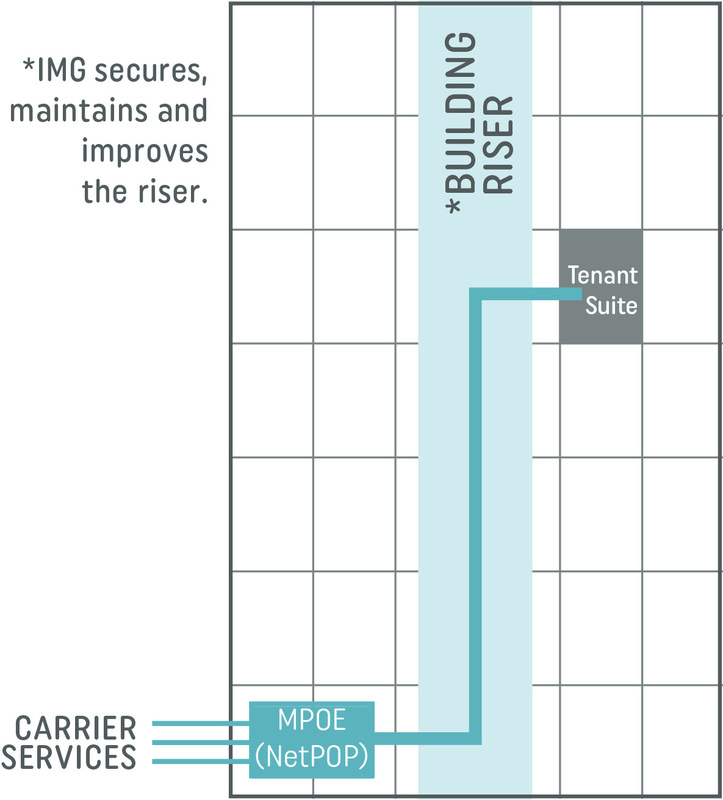 IMG service begins at the carrier entry point into your building--also known as the Network Point of Presence (NETPOP) or Minimum Point of Entry (MPOE)--and continues to a demarcation point (DEMARC) within the tenant space. We are responsible for maintaining the Main Distribution Frame (MDF) and the entire riser infrastructure at your building. When IMG is awarded a building contract, we complete a comprehensive riser audit and store the results of our audit on IMG Advantage, our online riser management platform. Once populated, IMG Advantage allows us to proactively manage and maintain the riser on an ongoing basis, as well as provide access to comprehensive and real-time reporting on your building’s riser.